Lairroth is a realm which is desperately struggling to reclaim what has been lost whilst still holding on to what little vestiges of civilization appear throughout the land. It is a war-torn realm on the brink of cataclysm. It is a land of immense danger, vast intrigue, and ancient darkness. Over 200 years ago Lairroth experienced a cataclysm which warped the very fabric of reality. The histories claim that those known only as The Heroes of Light had forged a time of peace and safety out of a dark and malicious age, only to be betrayed by one of their own in a deceit so terribly potent that the very world hung in the balance. It is said that The Heroes of Light pulled Lairroth away from brink of destruction, bringing shattered semblance of salvation, but at a terrible cost. Cities burned, whole nations were frozen over, and the servants of destruction stalked the land. Those few people of Lairroth who survived ‘The Betrayal’ bonded tightly together in small groups and rarely left their homes. The wilderness reclaimed that which man had once taken for himself, and the untouched places of the world vanished into darkness. The true histories of Lairroth faded from memory and were lost to time. Slowly, the nations of old raised their flags again and new kingdoms grew out of the fog; yet even these mighty bastions are but minor shadows of the glory of that which had come before. In the aftermath of the cataclysm, in the shadow of the betrayal, only the bravest few have the courage to face the dangers that lie beyond the walls of their homes. Only one singular event in the last two centuries has been terrible enough to truly rally the kingdoms and set forth the marching of armies. In the year 206 Post Betrayal, a prince amongst demons rose from the dreaded realm known as The Abyss and waged war against the living. In the southern kingdom of Nadrak, the lines of battle for The Dark War were drawn. The walking dead ravaged the land, Dragons flew in the sky, and some believe that The Heroes of Light rose again to do battle with the indomitable forces that threatened the realm once again.. In the end, brave souls gathered from every kingdom; sparking forgotten bonds of fellowship amongst the neighboring kingdoms, and the demon prince was defeated. An unbreakable magical spell of historic magnitude, known as The Ascendant Ward, was cast upon all the land so that none would ever be able to attain such dangerous power again. Beginning in 210 Post Betrayal, Lairroth experienced at cataclysmic event which is quickly becoming known as The Chronophage. The nature of this magical affliction involved an extreme alteration of the flow of time in various regions throughout the continent. 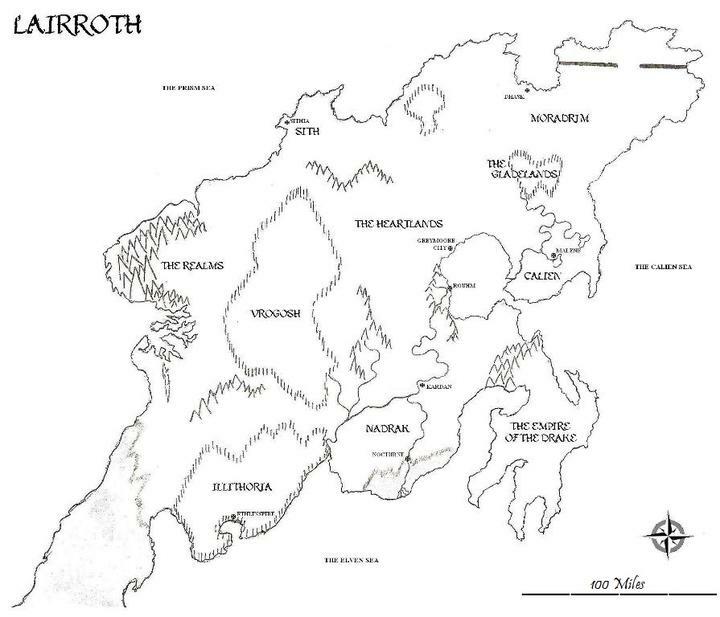 Impenetrable walls of enchanted fog suddenly formed on the borders of every kingdom throughout Lairroth, creating magical boundaries which isolated the kingdoms. Within each of the separate realms time flowed at an independent rate, allowing for the neighboring kingdoms to experience the shifting of day, night, seasons, and even constellations at completely different speeds. In some lands, hundreds of years passed without word from the outside, while in others less than a single year went by. A combined effort from heroes brought the Chronophage to an end, reuniting Lairroth once more. And yet the people of Lairroth are just beginning to recover, slowly rediscovering their neighbors. The Chronophage is believed by most to have been created as a purposeful magical weapon intentionally designed to separate the Kingdoms of Lairroth from one another. This belief has been formed mostly due to the mysterious way that the ‘Fog of Time’ appeared directly upon the borders of various nations. Many theories exist to explain the potential reasons for creating the Chronophage, but none have, as of yet, been verified.